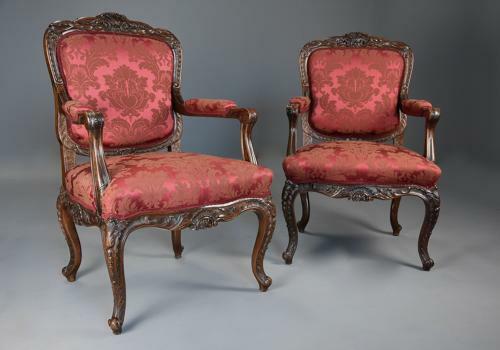 This pair of chairs consist of a finely carved top rail with central carved shell decoration with foliate and harebell designs with further scrolling leaf and shell carved decoration, the carving typical of Rococo style influences. This leads down to the upholstered back with carved lattice supports below, the arms having upholstered armrests with shaped, moulded and carved arm supports leading down to the upholstered seat. This leads down to an elaborately carved and shaped front rail with central carved plume decoration and acanthus carving, this design replicated on the shaped side rails. The chairs are supported by cabriole legs with harebell and foliate carved decoration terminating with a scroll foot. The red damask is in good condition so could remain on the chairs or once purchased the chairs could be easily be reupholstered in a fabric of choice.